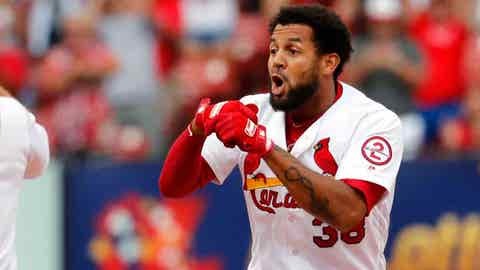 Jose Martinez singled on a high fastball, giving the Cardinals their ninth walk-off win this season. ST. LOUIS — Jose Martinez is making the most of his limited opportunities. Martinez sliced an opposite-field pinch-hit single to the right-center field gap off Wade Davis with one out in the ninth inning, driving in the tying and go-ahead runs and lifting the St. Louis Cardinals over the Colorado Rockies 3-2 on Thursday. “Trying to put the ball in play, trying just to get one run, that’s the most important thing,” Martinez said. Greg Garcia singled with one out against Davis (1-4) and took third on a single by rookie Harrison Bader. It was the first career walk-off RBI for Martinez, whose playing time has decreased since Mike Shildt became the interim manager on July 14. Colorado, which began the day one game back for the NL’s second wild card, lost three of four at the Cardinals. The Rockies had been seeking to tie the franchise record of nine straight series without a series loss but instead lost a series for the first time since dropping two of three at San Francisco from June 26-28. St. Louis starter Miles Mikolas allowed two runs — one earned — and seven hits in seven innings. Rockies starter Antonio Senzatela gave up one run and five hits in six innings. After the Cardinals loaded the bases in the sixth, Senzatela struck out Bader on a curveball in the dirt with an 0-2 count. Tyler O’Neill put St. Louis ahead with a sacrifice fly in the third. Gerardo Parra had a tying single in the fourth, and Colorado went ahead when Ian Desmond hit a bouncer to the third-base side, and Mikolas made an off-balance throw that hit the tarp in foul territory in right field. Desmond was credited with a single, and Nolan Arenado came home from third on the error. O’Neill made a running catch against the wall right-field wall in the first inning to rob Arenado of an extra-base hit and a diving catch of a liner off of Trevor Story’s bat in the fourth. Rockies: 2B DJ LeMahieu (left oblique strain) was reinstated from the 10-day DL and 2B Garrett Hampson was optioned to Triple-A Albuquerque. Cardinals: OF Marcell Ozuna left in the fifth inning because of discomfort in one of his left toes. 2B Kolten Wong (left knee inflammation) began an injury rehabilitation assignment at Class A Peoria and is expected to join the team this weekend in Pittsburgh. Rockies: RHP German Marquez (9-8, 4.82 ERA) starts Friday’s opener of a three-game series at Milwaukee. He is 4-0 with a 3.03 ERA in his last five starts. Cardinals: RHP John Gant (3-4, 3.49 ERA) starts a three-game series on Friday at Pittsburgh, where RHP Chris Archer (3-5, 4.31 ERA) is to make his Pirates debut after his acquisition from Tampa Bay. Gant is coming off his shortest outing of the season, lasting 4 1/3 innings in a 5-2 loss to the Chicago Cubs on Sunday night.